I've had a rare weekend of telly. And instead of just lounging on the sofa (well, as well as just lounging on the sofa) I thought I'd see how the experience is changed by a slightly different sort of second screen. 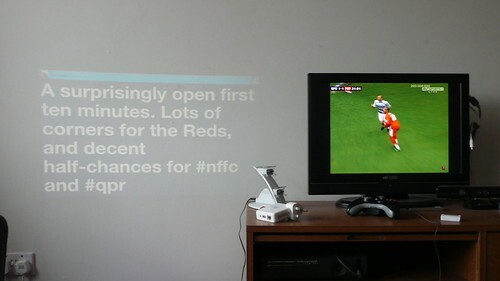 Not the usual twitter on iPad fiddling, but a little pico projector beaming Dextr next to the telly. It was interesting. I liked having the first and second screens at the same distance, in the same plane. Sometimes you just want to stare in the same general direction, not switching focus back and forth from near to far. And I liked the automatic nature of dextr, you don't always want to be prodding and poking at your feed, you just want to let it spill over. 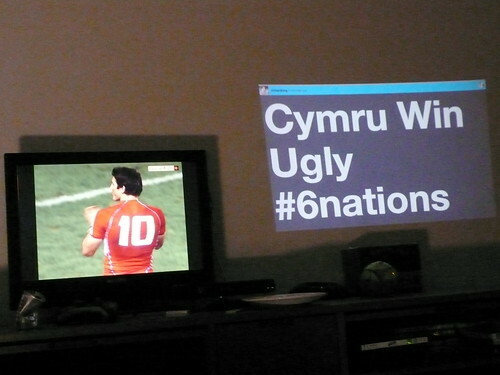 I was expecting it to work better in low light - that's the usual assumption about projectors. But it was actually a better experience in a well lit room. 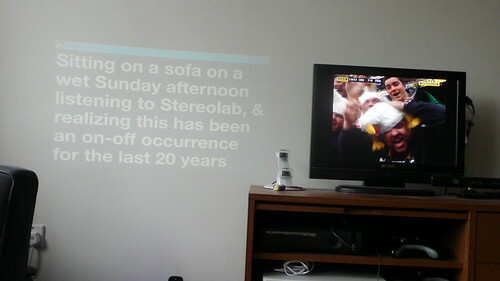 Dextr's so big and contrasty that you can read it easily and the faint projection on the wall is appropriately calm and ambient. It probably shouldn't be as bright as the telly. And, in a light room, the projector doesn't feel like the centre of attention, you can't really tell where it's coming from. It's a little magic. And the drifting messages from my twitter feed, occasionally fading into silence, were the perfect accompaniment to an afternoon of lazy sport. 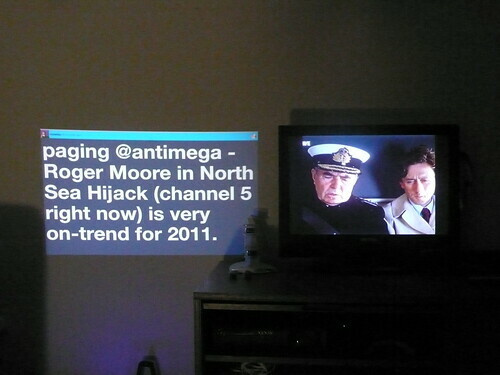 Later in the evening, when watching North Sea Hijack, it also occured to me that having the twitter feed up there next to the telly also makes everything more social; the twitter stuff becomes another component for the banter in the room. I bet there's a load more you can do with it though, to surround the telly with other stuff; complementary, distracting, whatever. That'd be worth playing with.